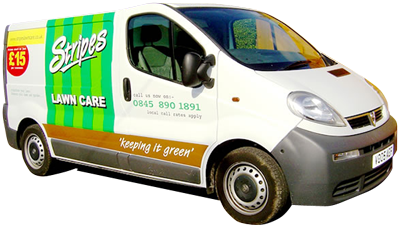 Commercial & Domestic Lawn Care Service based in New Inn South East Wales, Stripes Lawn Care is a privately owned and independent business specialised in lawn care services and treatments. The most important part of Stripes Lawn Care business is its customers and we realise the importance of keeping you informed about the services we provide, therefore we have taken the time to produce this website which explains a little more about the Stripes Lawn Care treatment programme and provides you with information about maintaining your lawn. As an independent company Stripes Lawn Care sources and uses what we believe are the best products the market has to offer and our commitment to our customers is that we will continue to do this in order to continually improve our service. Our staff are City and Guilds trained in turf management and have NPTC certification in the Safe use of Pesticides, we are also members of the Institute of Groundsmanship and The UK Lawn Care Network. Stripes Lawn Care will develop a healthy, green lawn over a season, customers are guaranteed satisfaction, subject to adhering to the on-going advice of proper cutting and watering practices. If you are not satisfied with the results of any application or service, notify us within 30 days of that service and we will resolve the problem to your satisfaction or your money for that service will be fully refunded. If you live in any of the areas above and are looking for a lawn treatment program or lawn care services that will transform your lawn, then please contact us or call us for a free lawn survey.